As a woman travelling in Bangladesh, it’s a good idea to pay attention to local customs in terms of dress. Ladies here usually wear either a sari, a long dress, or a salwar kameez (a long tunic worn over trousers with a scarf/shawl) and as a visitor loose fitting clothes which cover the legs and shoulders are the best bet – you will get a lot of stares as a foreigner anyway, there’s no need to attract even more by wearing tight T-shirts or shorts. My original kit included a couple of shirts but that wasn’t going to be enough for a month in a hot and dusty country so it was time to go shopping! 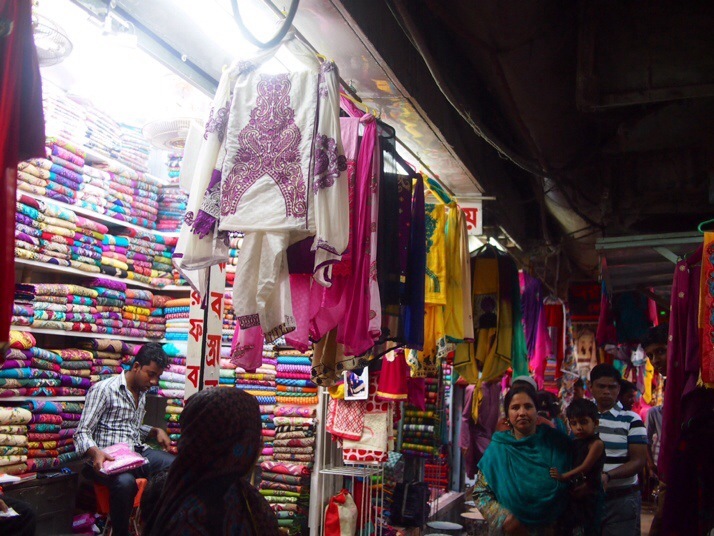 Tempted by the bright colours (and relative similarity to my usual trousers and shirt) of the salwar kameez I decided to try one for myself and Andrew and I ventured into the chaos of Khulna market. With dozens of small shops all displaying a wide variety of patterns and colours and all seemingly different from each other it was quite overwhelming at first and we did a full circuit without approaching a shop. Eventually I spied one that I liked and pointed it out to the shopkeeper who promptly pulled out three more colours in the same style, but I preferred the green one which he had on display. I’d heard in the past that it is common to have clothes tailor made in Asia but I’d naively assumed that buying from a market I would choose my style, be offered a choice of small, medium or large and be ready to go. So I was alarmed when he unpinned the tunic from the dummy and it was huge and obviously unfinished at the neckline. As we agreed on the price (about £10), I tried to ask him about the finishing and if it was included. His English was only slightly better than my Bengali but eventually he understood my question and indicated that I had to take it to a tailor to be finished and directed us to a shop around the corner. The tailor was a little less intimidating than the shops and he quickly started taking measurements and making cryptic notes on a piece of paper, asking how long I wanted the tunic and showing me a couple of different options for the finish on the hem of the trousers. Within ten minutes we were on our way with the receipt. Two days and an incredibly low £2 later we excitedly collected the adjusted clothes and scurried back to the hotel to try them on! The salwar (trousers) look like baggy clown pants and I wasn’t sure how I’d feel wearing them, but actually I’m really pleased with the result and it’s cool and comfortable in the heat of the day although I don’t think I’ll be wearing them after we leave Bangladesh. The only bit that I can’t get used to is the scarf which seems to fall off my shoulders every other minute. I assumed that local women must have some kind of trick to keep it on but when I asked a lady who we met on the train, she laughed and replied ‘habit’ so I guess it’s just practice… Another upside is that practically every time I’ve worn it locals have commented approvingly asking where I bought my outfit or saying ‘nice dress ‘ or ‘Bangla dress’. 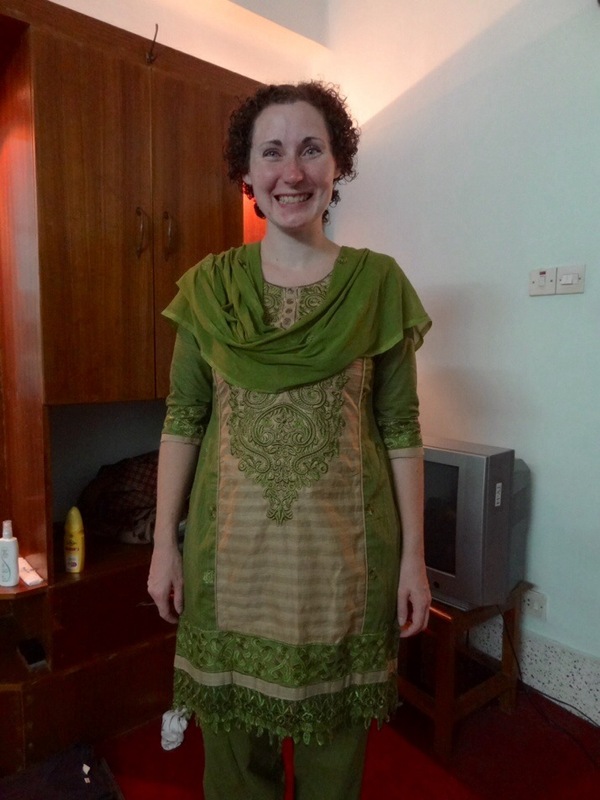 This entry was posted in Experiences and tagged Bangladesh, salwar kameez on April 6, 2014 by Julie. Well, Julie mixing it with the locals ;-) You look smashing! I don’t think I quite blended in ;-). Thanks! Safety pins always help keep saris in place, so perhaps worth a go? I find wearing it off one shoulder helps sometimes. Then there are also ways to wear it off one and tie it on the other side. Did Andrew invest in traditional clothes? Thank you! Safety pins are a good idea. I don’t think I was helped by the fact that it’s chiffon and so quite slippy. If I bought another I’d look for a cotton scarf, but I was so confused by the whole tailoring thing that I didn’t think of it first time around!